Here is a little card inspired by the song "Puff The Magic Dragon" sung by Peter, Paul and Mary in 1963. I loved this when I was a child and sang it to my children when they were little, so they loved it too. My digi stamp is from Bugaboo and has been coloured with promarkers and layered with die cut mats. The borders have been punched and layered with little gems added. The sentiment is from LOTV and has been layered onto a star die cut. The backing paper is from Paper Adventures and the ric rac ribbon is from my stash. He looks so cute, love the bold colour combo. Thanks for joining in the fun at PFP this week. Oh my goodness I am in LOVE with this adorable card!! Sooooo cute! Thanks for joining us at Catch the Bug Challenges! Hi Christine - what a great card. Love the sweet little dragon (now I remember Puff the Magic Dragon on Ed Stewpot's Junior Choice radio programmes - probably showing my age a bit here ;)!) and great colour choice too. Thanks for playing along at Incy Wincy Designs this time. Your card is soooooo very cute! 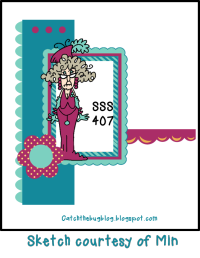 Thanks for sharing this beauty with us at Bugaboo Stamps' Stella Says Sketch Challenge. Good luck, and please join us again soon! Love the monochrome card! a gret use of our sketch, thanks for joining our SSS challenge! I LOVE the green he is adorable!! Thanks for joining us for Catch the Bug Stella Says Sketch, hope to see you again! Dawn Bugaboo DT.